Ever since we got all-beef hot dogs in our CSA shares, I have been wanting to make corn dogs. Maybe it was all this talk in late August and the beginning of September of state fairs. As we all know, “state fair” is a euphemism for “fried food on a stick” — just about the best two things ever combined. If I had any reason to go to Iowa, it would be for the Iowa State Fair. The Iowa State Fair (tagline, “Nothing Compares”) website features a ticking count-down to the next fair (August 9-19, 2012). Whoa! More importantly, the fair historically features over 200 food vendors, most of which are selling something fatty and super-calorific. And if the food alone doesn’t induce visions of cardiac arrest, there is always, of course, the famous butter cow sculpture — which I imagine is awe-inspiring. The viewing experience is likely enhanced by checking out the sculpture while consuming fried butter on a stick. In all honesty, I couldn’t dream of anything better to eat when taking in a life-sized representation of of cow rendered in its own product (this all seems very un-kosher . . .). The best part about the Iowa State Fair website is the food page, which features an entire directory devoted to foods on a stick, most of which are fried. So in honor and appreciation of all things State Fair, I give you DIY mini-corn dogs, CSA-style. Probably the best corn dogs out there for you. No, seriously! These hot dogs are made from grass-fed beef and are packed with omega-3’s! 1. In a large bowl, deep enough to dip the skewered dogs in easily, combine the cornmeal, the flour, the baking powder, the baking soda, and the cayenne pepper. You can tinker with the spices if you like, substituting maybe paprika for cayenne, or maybe adding some Old Bay. Because I just kind of want the ultimate plain corn dog experience, I keep the flavorings to a minimal. Why distract yourself from the pure, unadulterated taste of fried? 2. Add the milk and stir it in gently with a fork. The batter should be thick and lumpy —like pancake batter. Let the batter rest for 10 minutes while you prep the hot dogs. 3. Cut each hot dog and each skewer in half. For the skewers, I tried breaking them in half, but then I didn’t like the look of the ragged ends that my sorry stick-snapping skills left. So I used a pair of wire cutters. I know. So food-safe! But they did the job! Insert a skewer about a third to halfway through the end of each hot dog-half. 4. In a large Dutch oven, heat the oil over medium-high heat. It might take a while for the oil to get up to the right temperature. You don’t want the oil to smoke, but you want it to be nice and hot. You can check the oil temperature with a thermometer (it should register between 350-375°), or you can just do what I did and drop a little bit of the batter into the oil to check. If it starts frying up beautifully, your oil is at the right temperature. Just be careful to not let your oil burn. If you are lucky enough to own a deep fat fryer, this is even easier. 5. Holding the stick, dip each skewered dog into the batter. The batter should be thick enough to coat each dog evenly, but not so thick as to be stodgy. If it seems too thick, you can thin it out with just a little more milk. Carefully drop the corn dogs — sticks and all — into the boiling oil. Be careful not to overcrowd them or the oil’s temperature will drop, and your corn dogs will come out greasy instead of crispy. I fried no more than four or five at a time. 6. Line a colander with paper towels. Let the corn dogs fry until they are nice and golden. Using a pair of tongs, remove each dog by the stick when it is done. Let them drain upright in the colander. 7. Serve them with some good mustard, or anything else you like with your corn dogs like ketchup, relish, Cheez-Whiz . . .
Now that you are done frying, what the heck do you do with all this oil? Well, according to Cook’s Illustrated, you can reuse it without it tasting stale or rancid as long as you freeze it. Let the oil cool down completely. Carefully strain it into a clean, dry bottle (I use an empty plastic bottle, or a wine bottle). To strain, I pour the oil through a coffee filter. Freeze. Before reusing, be sure to smell or taste it. If it smells “fishy,” or tastes off, toss it. When in doubt, throw it out! I can honestly say that I have never eaten a corn dog in my life. This recipe looks yummy! I’m inspired to make some! You have never had a corn dog? Oh my gosh! Well now I am convinced you should make some! 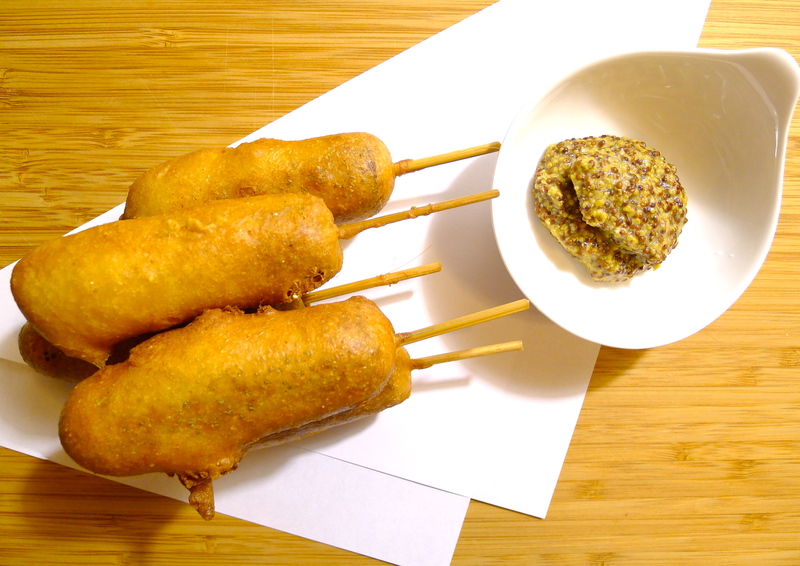 Because your very first corn-battered dog on a stick should be a good one! Your recipe sounds delicious! I’ve had my share of Fair food, but never tried creating it at home before. Might have to give it a shot! Definitely! I was always a little hesitant to try my hand at making them at home too. I think it’s the amount of oil; deep frying is always a little intimidating! But once I did it, I realized that it really didn’t make much of a mess at all. But now that I know that deep frying at home is easy, it’s dangerously tempting to fry everything now!